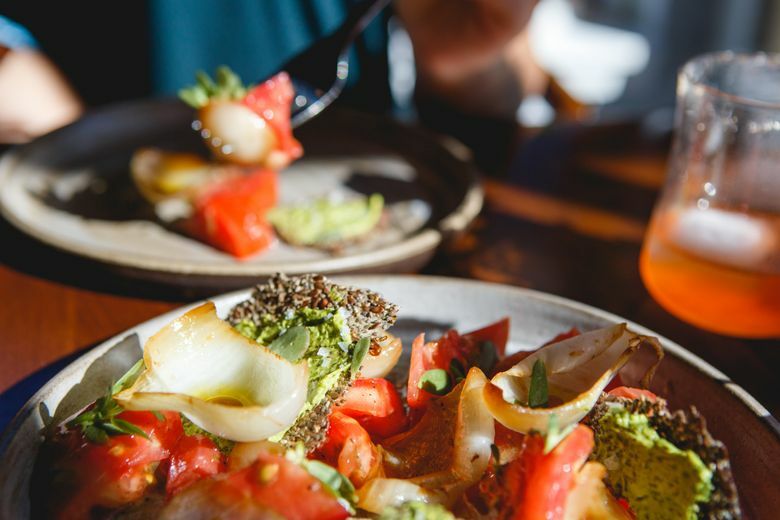 Midwest natives Nick Coffey and Nova Askue stoke their passion for ultra-local food on their own special San Juan island. 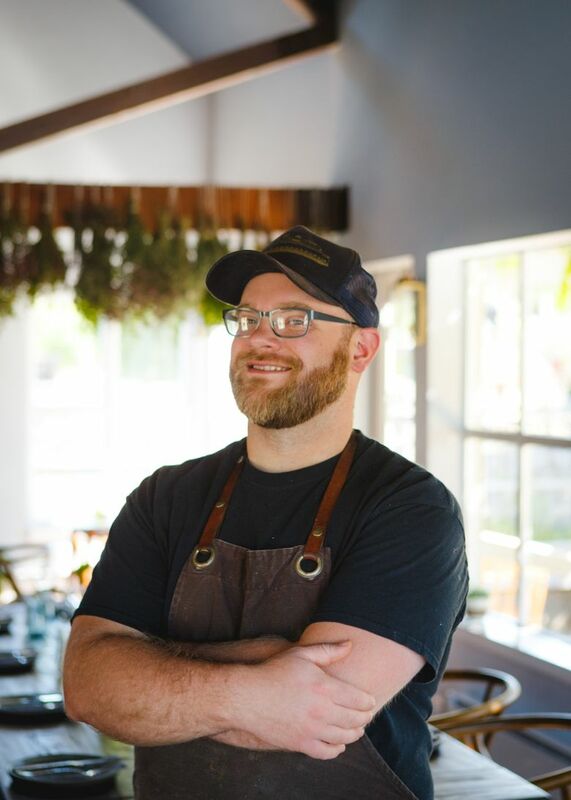 “PEOPLE HAVE A tendency to fall in love with the first San Juan island they go to,” says chef Nick Coffey. For him and Nova Askue, both Midwest natives, it was friendly, bucolic Lopez, the first stop on the ferry from Anacortes. The couple camped there with friends seven years ago. They picked up essentials at Blossom Grocery; hopscotched the island’s many farm stands, gathering more food for a campfire dinner; and woke early to catch the sunrise at Spencer Spit. Since then, Lopez had been their “safe haven,” the place they headed whenever they wanted to escape the city. Now they live there. 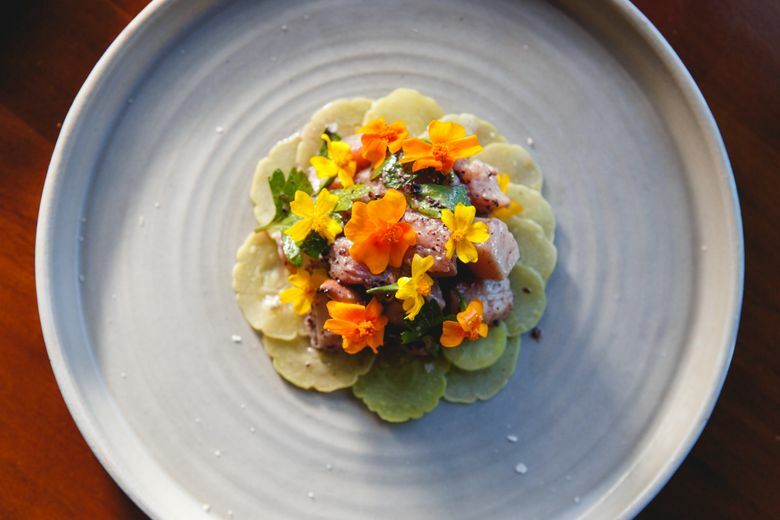 In April, Coffey and Askue opened a restaurant in Lopez Village. It seemed appropriate to call it Ursa Minor, after the constellation that incorporates the North Star, so often used for guiding people home. 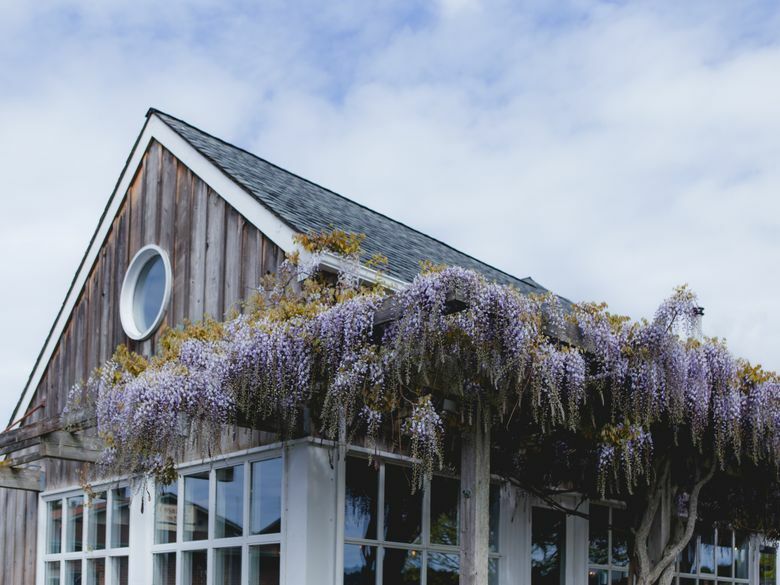 In high summer, a heavy fringe of wisteria overhangs the restaurant’s front porch. The building was designed by legendary Pacific Northwest architect Roland Terry, known for his use of natural materials and designs that flow from inside to outside (see Canlis). Ursa Minor’s spare, airy interior feels beachy in the best way. It’s filled with light from windows on three sides. Bundles of drying herbs hang from trusses supporting the peaked ceiling. Bentwood chairs surround dark-stained wood tables bedecked with garden flowers. You might find flowers on your plate, too, or algae, or lichen. 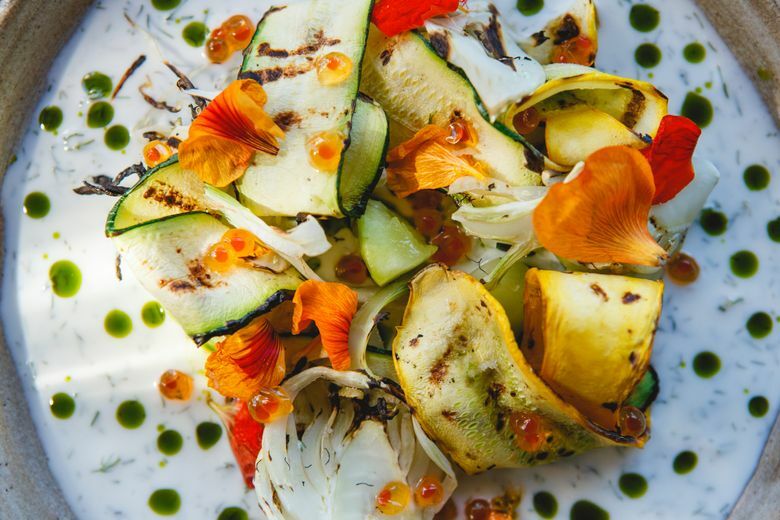 In July, marigold and nasturtium petals followed a trail of sweet black garlic across a strip of cured Baker River salmon anchored to the plate with horseradish crème fraîche. 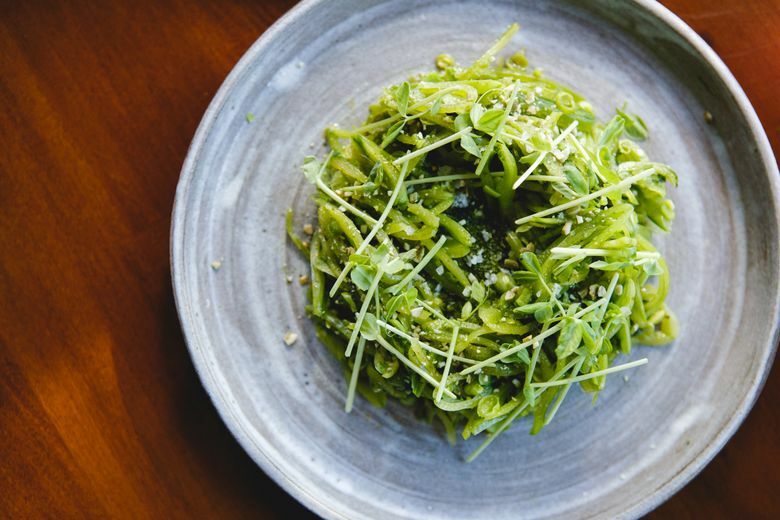 Sea lettuce, a green algae found in shallow saltwater pools, turned up in a salad, tangled among crisp snap peas, pea vines and mint, cushioned on creamy ricotta. Reindeer moss, actually a lichen, served as a crisp, salted nest for soft-cooked quail eggs. Dehydrated kelp speckles the house-made butter. 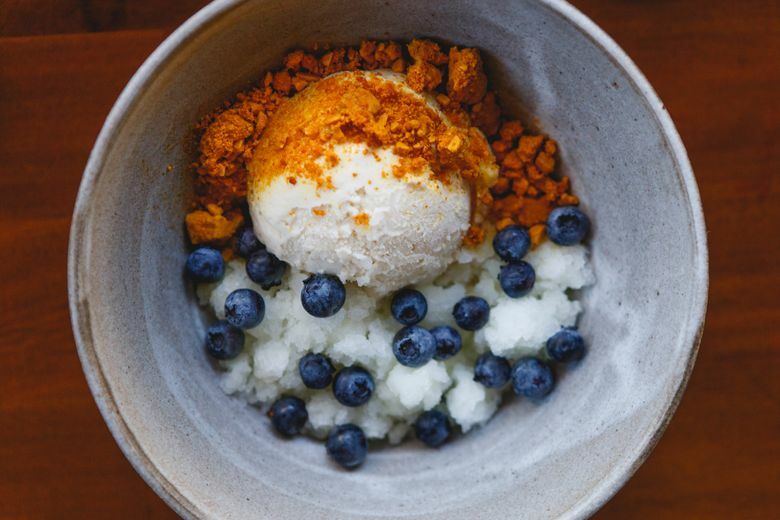 It comes with bread made by an Orcas Island baker who uses seawater as the only salt. Coffey’s mindset is so resolutely local, you won’t even get a slice of lime with your Big Gin and tonic; citrus isn’t indigenous to the islands. For acid in his cooking, he’ll juice, extract or naturally dry sour plants like rhubarb, red currant or sorrel. Verjus, pressed from unripened grapes, brightened a bowl of buttered fava beans and fresh peas topped with a poached egg. Herbs like lemon balm and mint give other dishes a lift. Instead of olive oil, he uses domestically produced grapeseed oil, “a flavor not unfamiliar to the island,” he says, or animal fat. Plenty of livestock is raised on Lopez, source of the lamb loin chop he paired with roasted tomato sauce and summer squash. Poultry and cow dairy come from off-island. A few transport companies connect the San Juan Islands, Coffey says, and the Skagit Valley is the very fertile outer ring of their foodshed. “Everyone is growing something on the island, and we buy everything that’s offered to us,” he says. Ursa Minor is a passionate, personal expression of its owners’ ethos. Coffey, 33, and Askue, 32, met as students at the Milwaukee Institute of Art & Design. When they packed up their few belongings and traveled 44 hours via Amtrak to Seattle 10 years ago, they didn’t know what paths their lives would take. “It was not well thought out,” says Coffey in retrospect. This move was better planned. Their $25,000 Kickstarter campaign raised even more than that to cover the cost of outfitting and refurbishing the space. The community of 2,400 year-round residents welcomed them warmly. “When you need something, whether it’s the freezer breaks or a place to live,” Coffey says, people come through. 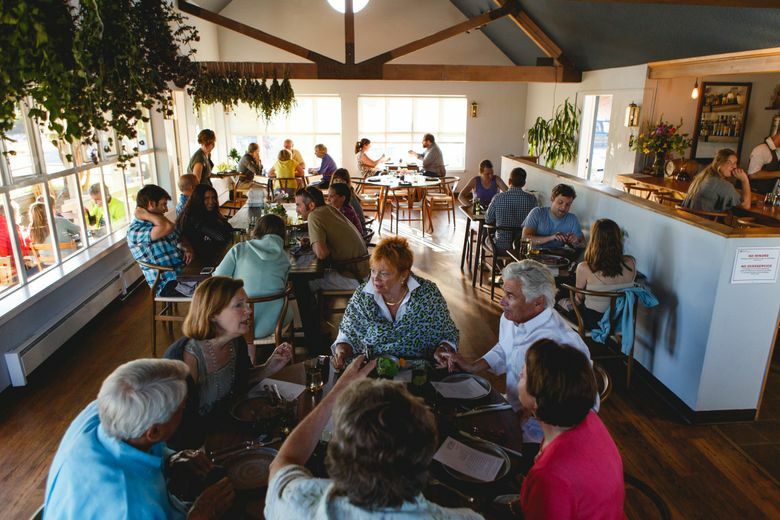 In mid-May, a month after opening the restaurant, the couple married on the 10th anniversary of their first date. Family members drove to Lopez from Wisconsin, Iowa and Minnesota. Askue’s three sisters wore wreaths of wildflowers in their hair. One of Coffey’s sisters officiated. They held the ceremony on a breezy bluff at Iceberg Point. The reception was at Ursa Minor, closed for the occasion.